The Particle group contains all the basic settings for the particle's appearance in 3D space. Controls include Size, Opacity, Color and how these properties vary over time. Particle Type pop-up: Selects from the several different particle types available. See the Particle Type page. Sphere Feather: Controls the amount of feather or softness for the spheroid-shaped Particle Types: Sphere, Glow Sphere, Cloudletrant and Streaklet. This parameter changes its name based on the Particle Type that is chosen, like Streaklet Feather when the Streaklet type is active. It is grayed out for the other Particle Types. A value of 0 will set no softness and the sphere will appear distinct. Low values give the look of sharp circles. High values give a more organic, smooth look. A value of 100 will cause the spheres to soften and blend into the surrounding particles. Top to bottom, Sphere Feather at 0 and 100. Particle Type is Sphere. Rotation group: The Rotation group rotates the particles independently on the X, Y and Z axes. Go to Rotation group. Size, Size Random: Sets the particle size in absolute pixels for both standard particle types and custom particles. High values create a larger particle and more density for the form. Size Random sets the randomness for Size, measured in a percentage. A value of 0 means no randomness. When the value is set above 0, the particles get slightly different sizes. A value of 100 will vary the size between the minimum and current particle size settings. Higher values means the randomness is higher, and the particles have more variation in size. Left to right, Size at 1 and 1.5. 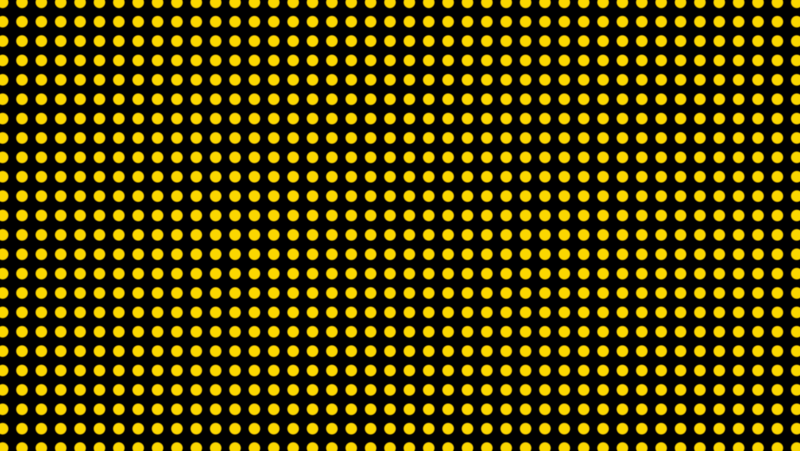 Left to right, Size Random set to 0, Size Random set to 100. Size Over pop-up: Sets the axis for the Size Curve. See the Using Curves page for more information. Size Curve: Allows you to control the size of the particles across the form. See the Using Curves page for more information. Size Curve Offset: Universally adjusts all values of the Size Curve and allows you to animate the values of the curve. See the Using Curves page for more info about curves. 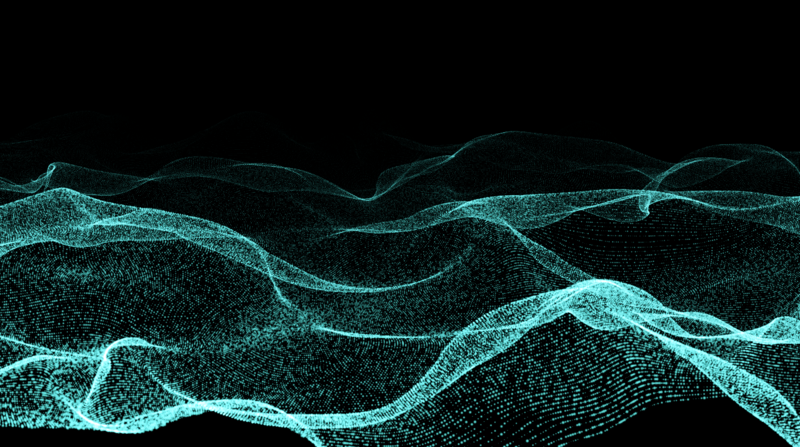 Opacity, Opacity Random: Sets the opacity of the particles. 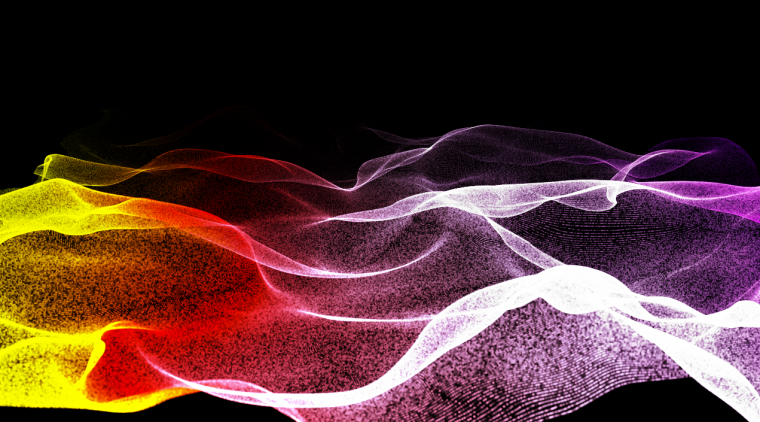 High values give a higher opacity, and 100 makes the particles completely opaque. 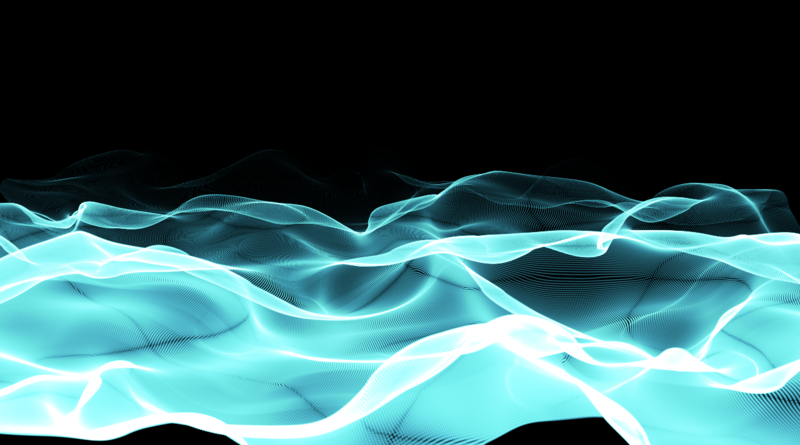 Low values give more transparency and a value of 0 makes the particles completely transparent. Opacity Random sets the randomness for Opacity, as measured in a percentage. A value of 0 means no randomness. When the value is set above 0, the particles get slightly different transparency levels. A value of 100 will vary the opacity between the minimum and current opacity settings. Higher values means the randomness is higher, and the particles have more variation in opacity. Left to right, Opacity Random set to 0, Opacity Random set to 100. Opacity Over pop-up: Sets the axis for the Opacity Curve. See the Using Curves page for more information. 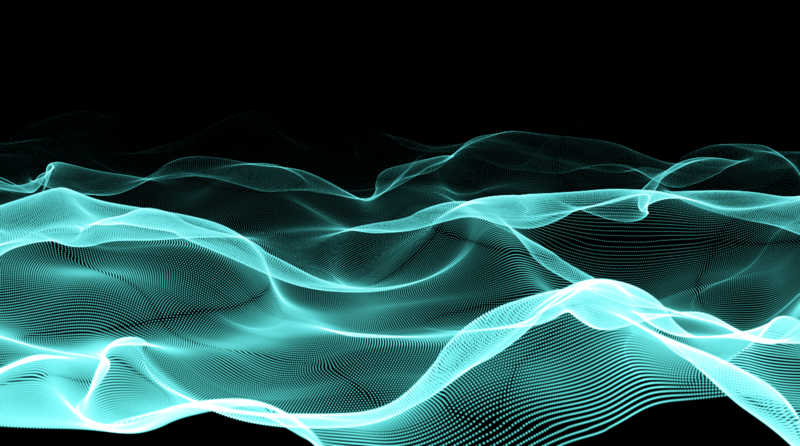 Opacity Curve: Allows you to control the opacity of the particles across the form. See the Using Curves page for more information. Opacity Curve Offset: Universally adjusts all values of the Opacity Curve and allows you to animate the values of the curve. See the Using Curves page for more info about curves. Color: This property sets the color of the particles. Click the swatch to set the color, or click the eyedropper tool here to sample a color from your composition. Color Over pop-up: Sets the axis for the Color Ramp value. 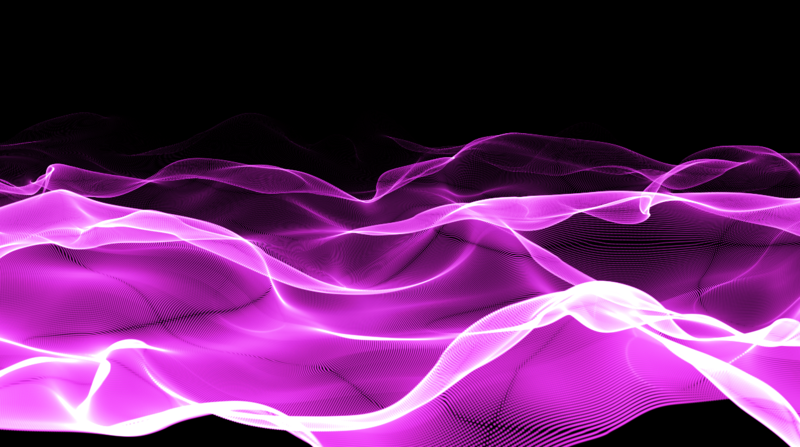 When set to any value other than Off, this will recolor the particles using the Color Ramp instead of the Color value. The way that the color is mapped over the form is identical to the way all curves are mapped over the form. See the Using Curves page for more information the map over pop-ups used throughout Form. Color Ramp: Allows you to adjust a color gradient that is applied to the form particles based on the Color Over pop-up. The gradient consists of a number of color boxes, and the gradient is interpolated between the boxes. 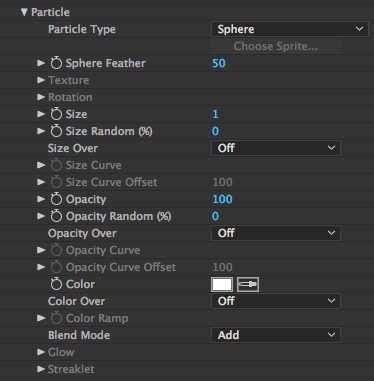 The color controls (including the Color Ramp) in the Particle group. 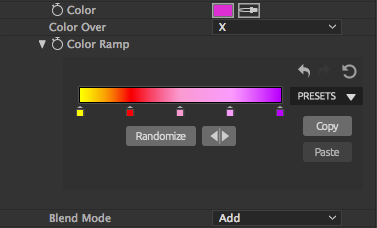 The Color Ramp gradient has four control areas for setting the color on the gradient, choosing a preset and randomizing or reversing the gradient. NOTE: The features in the Color Ramp area will only become adjustable if the Color Over pop-up is set to a value other than Off. Color Swatches: To add a color swatch, click in the area just below the gradient. The box will initially get the color the gradient shows at that position. Change, move or delete a color swatch: To change the color of a swatch, double-click it. Double-clicking the swatch will bring up the Adobe color picker where you can set the color for the swatch. To move a swatch, click and drag it sideways along the gradient. To delete a swatch, click and drag it downwards away from the gradient bar. Preset gradients on right side of the gradient: To select one of the gradient presets, click one of the buttons. This will immediately replace the current gradient. You can undo this by clicking the backwards facing arrow above the Color Ramp presets. The above Color Ramp preset applied over the X (i.e. horizontal) axis. Randomize Command button: Choosing this button in the command row will change all the boxes' to new colors. If you have five gradient boxes, then all five will get new colors. Undo button: this will undo the last change to the gradient. Reset button: this button will reset the color ramp to the default rainbow gradient. Flip Command Button: All color boxes are flipped around the center, reversing their order. This is useful for changing to the start and end color of the gradient. Copy, Paste Command buttons: These commands copy the gradient to clipboard, and paste the gradient colors from the clipboard. If nothing has been copied, then the Paste button will not appear in the control. The Blend Mode controls how particles are composited together. 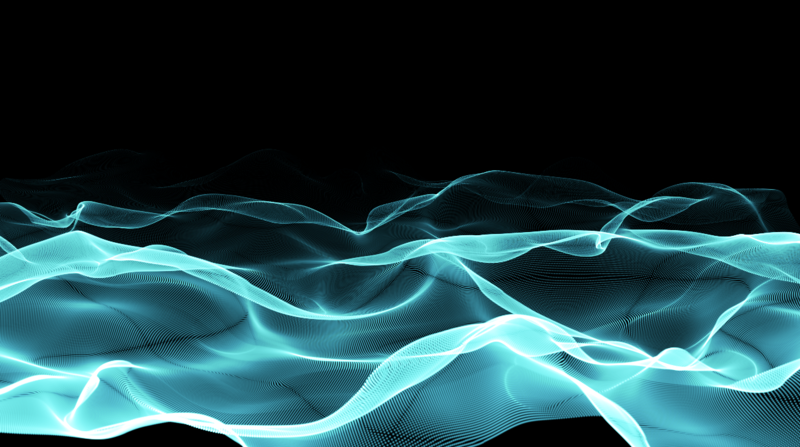 This works much like blending modes in After Effects, except the individual particles behave like layers in 3D space. Normal: Normal composite operation. Opaque particles will block particles behind them along the Z axis. Add: Particles are added together. Add gives an even brighter look than Normal or Screen and also disregards depth values. Useful for light effects and fires. Screen: Particles are screened together. Screen mode often results in a brighter look than Normal, and disregards depth information. Useful for light effects and fires. Lighten: Lightest color wins and the effect does not 'build up' like Add and Screen. Lighten means particles are composited in order along the Z axis, but only pixels that are brighter than the pixels behind them are written. The next two Blend Modes have more noticeable effects on sprites and textured polygon effects than they do normal particles. Normal Add over Life: Switches the blend mode from Normal to Add over the duration of the particle's lifespan. Useful for creating particles that remove their depth value and increase their intensity. Use the Blend Mode Over Life curves below to control this option. Normal Screen over Life: Switches the blend mode from Normal to Screen over Life. Use the Blend Mode Over Life curves below to control this option. Unmult: Keys out any pure black from the particle it's been given. Blend Mode Over Life: Allows you to control the Normal Add over Life and Normal Screen over Life Blend modes when selected in the Blend Mode dropdown menu. Glow group: The Glow group adds a glow to the particles. Note that these controls are only active when the Particle Type is Glow Sphere or Star. Go to Glow group. Streaklet group: The Streaklet group sets properties for a Particle Type called Streaklet. Active when the Particle Type is Streaklet. Go to Streaklet group.